Is this the end of hard disk drive data center era ? The leading microprocessor manufacturer company Intel has taken a revolutionary step by launching three new form factors for server-class SSDs. First one on the list is ‘ RULER’ form factor. 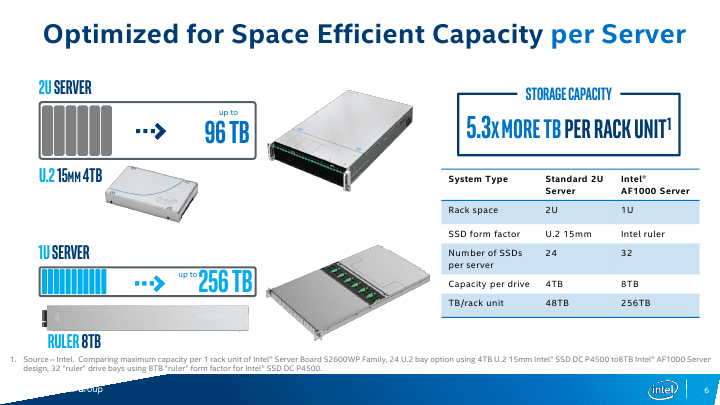 Based on the in-development Enterprise & Datacenter Storage Form Factor (EDSFF) , the SSD’s would be able to keep in themselves data up to one petabyte and that too in a single server rack. We all have seen pen drives and the SSD’s in certain standard shapes and sizes. Today we have an access to SSD of 3.5 inches for the desktop computers and 2.5 inches for the laptops. The new drives have a slimmer look and better shapes. The reason behind this new design is the server rack according to which, they will be able to load higher amounts of data in them.The storage of 1 petabyte i.e. 1000 terabytes will be available in the 1U server rack which is the smallest rack available and it uses Intel’s 3D NAND technology. The slimmer size and higher amount of storage has grabbed all the attention here and has become a topic of discussion among many. This step of modifying the devices and making them smaller but efficient will only make it better, even if the company fails to implement the ruler drive functions for the computers.